Vanderbilt University Medical Center transformed about half of a struggling shopping center into an outpatient hub, much to the delight of its growing patient base and the city of Nashville. By the mid-2000s, Vanderbilt had outgrown its main hospital campus at 1211 Medical Center Drive in a dense area of midtown Nashville. The provider decided to renovate the nearby One Hundred Oaks Mall and move more than 20 of its clinics to the shopping center at a fraction of the cost required to build out its campus. It opened its new center in 2009, moving predominantly wellness-oriented clinics from its main campus. That included dermatology, OB-GYN, preventive cardiology and imaging centers, a breast center and physical therapy, among others—occupying about 440,000 square feet of the nearly 900,000-square-foot mall center. Vanderbilt designed the former retail space with patient access, usability and new technology in mind. Patients would walk down a central hallway with physician offices and team/resident work areas on either side. They could grab a bite to eat before they were paged for their appointment. Patients register via paperless kiosks that speed up check-in times, allow patients to review medical records, make co-payments and schedule appointments. Patients who could travel to clinics easily, navigate them efficiently and tackle other errands were ultimately happier, said Dr. C. Wright Pinson, deputy CEO and chief health system officer of VUMC. Vanderbilt now does about 25% of its total business there and its ambulatory hub has grown to 2.2 million visits a year, he said. "As we moved into the notion that we need to go to the market and make our services more convenient, this was an important step. Now we have clinics in 130 different locations," Pinson said. "This project got us moved down the road of being market-focused and locating our services where it is convenient for patients." Vanderbilt was one of the early adopters of a patient-centered focus that is sweeping the industry. As more care transitions from hospitals to less expensive outpatient facilities, providers aim to increase access and reduce costs so patients stay healthy and happy—a twofold solution to improve care coordination and satisfy new payment models. Outdated shopping malls plagued with empty storefronts and declining foot traffic could be ideal locations for even bigger swaths of a provider's operations, said Ed Puerta, a partner at Nixon Peabody who represents landlords, tenants, buyers and sellers of commercial real estate. Opening a one-off urgent center or retail clinic in a mall—that is the tip of the iceberg, he said. "I've already heard stories about mall operators taking an equity stake in an anchor tenant, but that is putting a big Band-Aid over a major problem," Puerta said. "Replacing those anchor tenants would be more than just small clinics; we could see actual wings of hospitals." It's a solution that benefits providers, commercial real estate owners and the community. Vanderbilt's Pinson said the center's renovation has also revitalized the surrounding community. The clinics also save money and run more efficiently by sharing access to on-site lab and diagnostic equipment in lieu of coordinating with Vanderbilt's main campus. The standardized spaces can be easily expanded, which have also helped things run smoother. Healthcare real estate was largely immune to the economic downturn and shows few signs of slowing down now, experts said. In the first quarter of 2017, the overall U.S. medical office building vacancy rate was 8%, and that had rapidly declined over the prior three quarters in large part due to the aging population and increasing number of insured, according to the commercial real estate firm CBRE's 2017 U.S. Medical Office and Health Care Report. Investment in medical office buildings of at least 10,000 square feet increased substantially over the past seven years, eclipsing $10.2 billion in 2016, up from around $4 billion in 2010. Providers are armed with new analytics, similar to what retailers use, that home in on who their customers are, what types of procedures their doctors are performing, what type of insurance is being used and where the demand is. They are using that data to reposition how they provide service to patients, said Jim Hayden, executive managing director of Healthcare and Global Workplace Solutions at CBRE. "It all comes back to the best place to position some of these services to serve their existing population base and grow their market," he said. While malls may not be an ideal solution for certain providers, the empty big-box stores could house back-office staff or sophisticated call centers featuring some form of telemedicine, Hayden added. Looking at the evolution of airports, providers have an opportunity to similarly rethink the patient experience, said Todd Caruso, senior managing director of retail at CBRE. "It's all about the patient experience," he said. The Dana-Farber Cancer Institute in the Greater Boston area has also embraced a more accessible approach to treatment. It recently secured about half of a 290,000-square-foot mixed-use property at the former Atrium Mall, which is being remodeled into a medical hub in the Chestnut Hill neighborhood. It will serve as an extension of the institute's main campus and provide exams, infusions and supportive services to newly diagnosed adult cancer patients in a location featuring ample parking and connection to public transit. Patients will also have access to new mixed-use developments. "Retrofitting an existing facility instead of putting shovels in the ground—a lot of CFOs and CEOs of hospitals and health systems will say that is an appealing option," said Nirad Jain, a partner in Bain & Co.'s New York office. 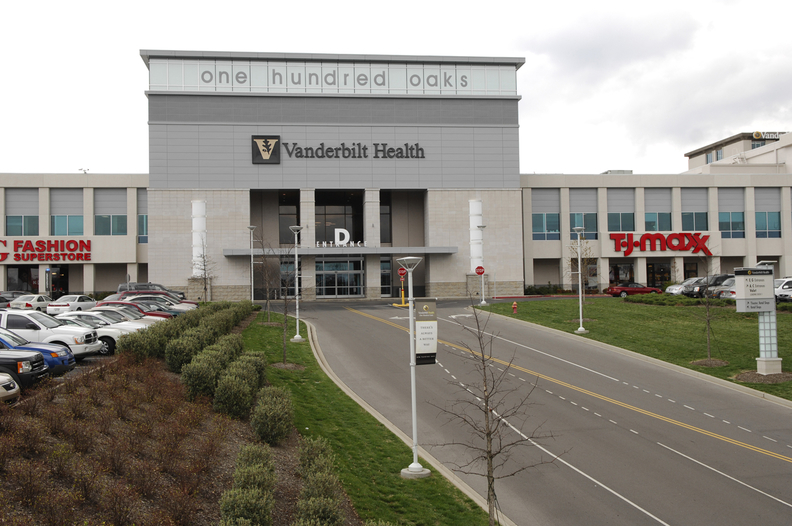 As for Vanderbilt, it's move to the One Hundred Oaks Mall has given it confidence to move and expand more of its outpatient practices, said Pinson. "For almost all of our ambulatory practice, we would focus on doing that away from our main campus," he said.